Cartridge produces solid blacks, sharp lines, and smooth grays. Prints fine lines and edges with detail. Cost and time efficient printing. 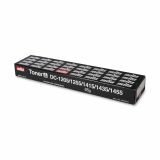 Kyocera 37041013 Black Toner Cartridge - Copier toner is designed to be used in Mita DC-1205, 1255, 1415, 1435 and 1455. Yields 2,000 pages.